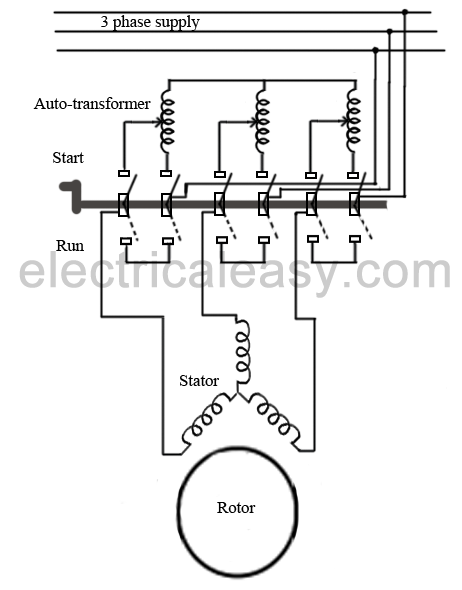 An induction motor is similar to a poly-phase transformer whose secondary is short circuited. Thus, at normal supply voltage, like in transformers, the initial current taken by the primary is very large for a short while. Unlike in DC motors, large current at starting is due to the absence of back emf. If an induction motor is directly switched on from the supply, it takes 5 to 7 times its full load current and develops a torque which is only 1.5 to 2.5 times the full load torque. This large starting current produces a large voltage drop in the line, which may affect the operation of other devices connected to the same line. Hence, it is not advisable to start induction motors of higher ratings (generally above 25kW) directly from the mains supply. 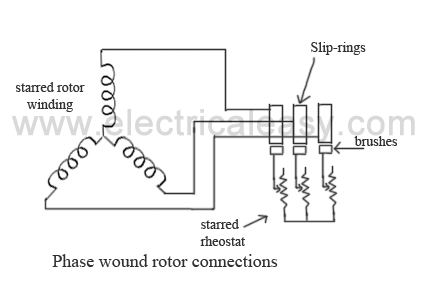 Various starting methods of induction motors are described below. Small three phase induction motors can be started direct-on-line, which means that the rated supply is directly applied to the motor. But, as mentioned above, here, the starting current would be very large, usually 5 to 7 times the rated current. The starting torque is likely to be 1.5 to 2.5 times the full load torque. Induction motors can be started directly on-line using a DOL starter which generally consists of a contactor and a motor protection equipment such as a circuit breaker. A DOL starter consists of a coil operated contactor which can be controlled by start and stop push buttons. When the start push button is pressed, the contactor gets energized and it closes all the three phases of the motor to the supply phases at a time. The stop push button de-energizes the contactor and disconnects all the three phases to stop the motor. In order to avoid excessive voltage drop in the supply line due to large starting current, a DOL starter is generally used for motors that are rated below 5kW. Obviously, the purpose of primary resistors is to drop some voltage and apply a reduced voltage to the stator. Consider, the starting voltage is reduced by 50%. Then according to the Ohm's law (V=I/Z), the starting current will also be reduced by the same percentage. From the torque equation of a three phase induction motor, the starting torque is approximately proportional to the square of the applied voltage. That means, if the applied voltage is 50% of the rated value, the starting torque will be only 25% of its normal voltage value. This method is generally used for a smooth starting of small induction motors. It is not recommended to use primary resistors type of starting method for motors with high starting torque requirements. Resistors are generally selected so that 70% of the rated voltage can be applied to the motor. At the time of starting, full resistance is connected in the series with the stator winding and it is gradually decreased as the motor speeds up. When the motor reaches an appropriate speed, the resistances are disconnected from the circuit and the stator phases are directly connected to the supply lines. Auto-transformers are also known as auto-starters. They can be used for both star connected or delta connected squirrel cage motors. It is basically a three phase step down transformer with different taps provided that permit the user to start the motor at, say, 50%, 65% or 80% of line voltage. With auto-transformer starting, the current drawn from supply line is always less than the motor current by an amount equal to the transformation ratio. For example, when a motor is started on a 65% tap, the applied voltage to the motor will be 65% of the line voltage and the applied current will be 65% of the line voltage starting value, while the line current will be 65% of 65% (i.e. 42%) of the line voltage starting value. This difference between the line current and the motor current is due to transformer action. The internal connections of an auto-starter are as shown in the figure. At starting, switch is at "start" position, and a reduced voltage (which is selected using a tap) is applied across the stator. When the motor gathers an appropriate speed, say upto 80% of its rated speed, the auto-transformer automatically gets disconnected from the circuit as the switch goes to "run" position. The switch changing the connection from start to run position may be air-break (small motors) or oil-immersed (large motors) type. There are also provisions for no-voltage and overload, with time delay circuits on an autostarter. This method is used in the motors, which are designed to run on delta connected stator. A two way switch is used to connect the stator winding in star while starting and in delta while running at normal speed. When the stator winding is star connected, voltage over each phase in motor will be reduced by a factor 1/(sqrt. 3) of that would be for delta connected winding. The starting torque will 1/3 times that it will be for delta connected winding. Hence a star-delta starter is equivalent to an auto-transformer of ratio 1/(sqrt. 3) or 58% reduced voltage. Slip-ring motors are started with full line voltage, as external resistance can be easily added in the rotor circuit with the help of slip-rings. A star connected rheostat is connected in series with the rotor via slip-rings as shown in the fig. Introducing resistance in rotor current will decrease the starting current in rotor (and, hence, in stator). Also, it improves power factor and the torque is increased. The connected rheostat may be hand-operated or automatic. As, introduction of additional resistance in rotor improves the starting torque, slip-ring motors can be started on load. The external resistance introduced is only for starting purposes, and is gradually cut out as the motor gathers the speed.